Cagliari’s top beaches: sardinia south beach Italy. The coastal track of Cagliari is about 50kms, from Capo Sant’Elia and Capo Boi, which offers beaches of great beauty. 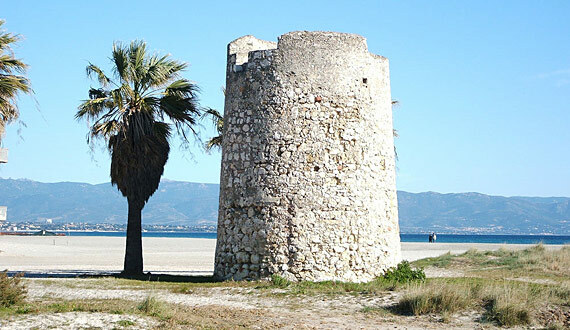 First between all the beautiful beaches is that of Poetto Beach Cagliari. It has white fine sand like talc which unwinds for kilometres, surmounted by the headland of Sella del Diavolo. The beach is easily reachable from Cagliari going along Viale Diaz and then Viale Poetto. The beach of S’Arrizzolu Saliu easily accessible with white sand, is separated by some white rocks with the nearby beach of Is Mortorius. The beaches of Cala Regina in Cagliari a small cove, rocky with rocks and granite stones smoothed by the transparent shallow sea, which makes it adapt for families with children. The beach of Kal’e Moru is formed by a flight of gold sand which falls into the sea after a few metres. Solanas beach has a depth which falls rapidly into the sea and therefore is not adapt for families with children. The Rei coast, sand and rocks are developed along the south-eastern track between Capo Ferrato and Cala Sinzias. The coves and beaches along this part of the coast are many, starting with the Costa Rei beach. The Capo Ferrato beach in Cagliari, is only accessible with an off-road vehicle or a moped given that at a certain point the road is unsurfaced. The beach is not equipped, but it worth the visit to admire the half moon of the white fine sand, licked by limpid waters.